Exported proteases are commonly associated with virulence in bacterial pathogens, yet there is a paucity of information regarding their role in Mycobacterium tuberculosis. There are five genes (mycP1-5) present within the genome of Mycobacterium tuberculosis H37Rv that encode a family of secreted, subtilisin-like serine proteases (the mycosins). The gene mycP1 (encoding mycosin-1) was found to be situated 3700 bp (four ORF's) from the RD1 deletion region in the genome of the attenuated vaccine strain M. bovis BCG (bacille de Calmette et Guérin) and was selected for further analyses due to the absence of expression in this organism. Full-length, 50 kDa mycosin-1 was observed in M. tuberculosis cellular lysates, whereas lower-molecular-weight species were detected in culture filtrates. A similar lower-molecular-weight species was also observed during growth in macrophages. Mycosin-1 was localized to the membrane and cell wall fractions in M. tuberculosis by Western blotting, and to the cell envelope by electron microscopy. Furthermore, M. tuberculosis culture filtrates were shown to contain a proteolytic activity inhibited by mixed serine/cysteine protease inhibitors and activated by Ca2+, features typical of the subtilisins. Mycosin-1 is an extracellular protein that is membrane- and cell wall-associated, and is shed into the culture supernatant. The protein is expressed after infection of macrophages and is subjected to proteolytic processing. Although proteolytically active mycosin-1 could not be generated recombinantly, serine protease activity containing features typical of the subtilisins was detected in M. tuberculosis culture filtrates. Microbial pathogens frequently utilize extracellular proteases as virulence factors, which often contribute significantly to pathology . These proteases participate in tissue destruction, inactivation of host defense molecules, activation of key regulatory proteins or peptides, nutrient acquisition and the processing of secreted signaling molecules that regulate gene expression. The M. tuberculosis genome revealed the presence of a large number and variety of putative protease genes, some encoding potential secreted proteases . This includes a family of five subtilisin-like serine proteases, the mycosins (1–5), which share a high degree of similarity and are constitutively expressed in M. tuberculosis H37Rv . In contrast to mycosin-2 and -3, mycosin-1 is not expressed in the attenuated M. bovis strain BCG, although the gene for mycosin-1 (mycP1) is present in the genome of this organism. This gene was found to be situated 3700 bp (four ORF's) from the RD1 deletion region, which has attracted considerable attention recently because of possibly being a locus of potential diagnostic proteins. Therefore, mycosin-1 was selected for further analysis. Here we report the cloning and expression of the gene for mycosin-1, mycP1, and the localization of the native and recombinantly expressed mycosin-1 protein to the bacterial cell wall / envelope. We show that mycosin-1 could be detected in M. tuberculosis culture filtrates and that these filtrates possess protease activity that could partly be attributed to a serine protease, possibly a subtilisin. Furthermore, we have demonstrated the expression of mycosin-1 during growth in macrophages and provide preliminary evidence that mycosin-1 may be proteolytically processed intracellularly. A 73 kDa GST-mycosin-1 fusion protein was detected in the insoluble (cell lysate) fraction of E. coli transformed with pGEX-P1 (Fig. 1). Most of the GST-mycosin-1 fusion protein was insoluble and significant amounts were lost during purification, consistent with the high degree of hydrophobicity predicted from the amino acid sequence (see Fig. 2). Addition of detergents to solubilize the fusion protein increased the amount of GST-mycosin-1 in the soluble fraction and enhanced purification yields. The purified product was used to generate antiserum against mycosin-1. Expression of GST-mycosin-1 fusion protein in E. coli . Bacteria were transformed with vector only (pGEX-2T, left panel) or vector expressing GST-mycosin-1 fusion protein (pGEX-P1, right panel). Lysates were prepared before (U) and after (I) induction with 0.1 mM IPTG for 2 hours; recombinant proteins were purified (P) by GST-affinity chromatography. 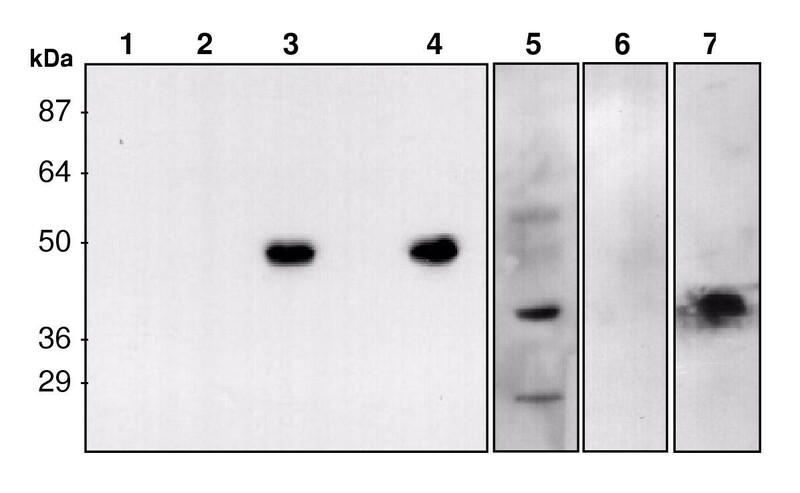 In each case, fractions were resolved by SDS-PAGE (a) and then analyzed by Western blotting (b) using an anti-GST monoclonal antibody as the primary antibody. Molecular weights (in kDa) are indicated on the left. 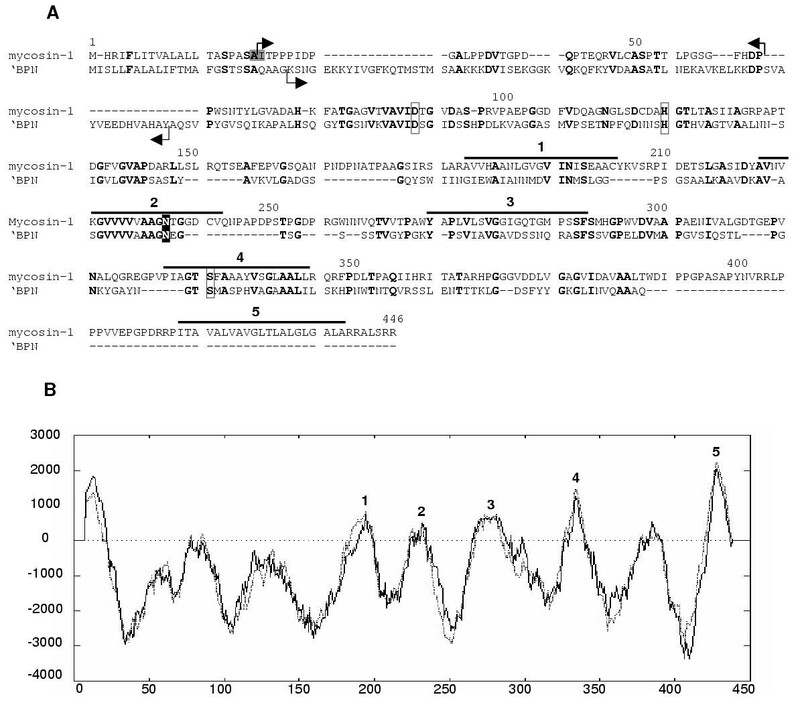 Sequence analysis of the protein sequence of mycosin-1. (A) Sequence alignment of mycosin-1 with the B. amyloliquifaciens subtilisin BPN protein. The conserved amino acid residues are indicated in bold. The catalytic residues (D-90, H-131, and S-332, mycosin-1 numbering) are in open boxes; the oxyanion hole (N-237) is in a closed box. The mycosin-1 signal peptide cleavage site (A-21/I-22) is shaded. The arrows below the BPN sequence bracket the propeptide sequence; arrows above mycosin-1 indicate the predicted propeptide. Overlines (numbered 1–5) above the mycosin-1 sequence indicate hydrophobic regions and correspond to domains 1–5 shown in (B). (B) Hydrophobicity plot of mycosin-1. As reported previously , the purified anti-mycosin-1 antiserum was tested by performing Western blot analyses on cellular lysates of M. smegmatis heterologously expressing mycosin-1. A ~50 kDa immunoreactive band was only detected in M. smegmatis transformed with p19K-P1 (designated M. smegmatis -P1; Fig. 3, lanes 1–3), consistent with the full-length proform of mycosin-1, having a calculated molecular mass of 46 kDa. The detection of the full-length isoform suggests that propeptide cleavage did not occur during expression in M. smegmatis. Expression of mycosin-1 in mycobacteria in culture and during infection of macrophages. Samples were resolved by SDS-PAGE and analyzed by Western blotting using anti-mycosin-1 antiserum. Lanes: 1, M. smegmatis; 2, M. smegmatis transformed with p19Kpro; 3, M. smegmatis transformed with p19K-P1; 4, M. tuberculosis clinical isolate GSH-3052 cell lysate; 5, M. tuberculosis clinical isolate GSH-3052 culture filtrate after growth in Kirchner's broth for 6 weeks; 6, lysate of uninfected P388D1 macrophages; 7, lysate of M. tuberculosis clinical isolate GSH-3052-infected P388D1 macrophages. Molecular weights (in kDa) are indicated on the left. To examine expression of mycosin-1 in M. tuberculosis GSH-3052, cellular proteins were extracted with SDS from 1-, 2-, 3-, 4- and 6-week cultures. A single immunoreactive band of the same molecular weight as the recombinant protein expressed in M. smegmatis-P1 was detected by Western blot analysis using anti-mycosin-1 antiserum (Fig. 3, lane 4). The protein was expressed throughout the growth curve of M. tuberculosis, but the highest expression levels in cell lysates were detected in 1-week cultures . Culture filtrates throughout the growth cycle also contained mycosin-1 immunoreactivity, but a decrease in molecular weight of mycosin-1 in the filtrates of weeks 2–4 (results not shown) and a further decrease in the 6-week culture (~40 kDa) (Fig. 3, lane 5), were observed. This suggests that there may be processing of the mycosin-1 proenzyme at the later time points. Alternatively, it is also possible that after extended culture, additional members of the mycosin family of proteins are expressed that cross-react with the anti-mycosin-1 antiserum, although no cross-reactivity was observed previously with mycosin-2 and -3 . In contrast, no mycosin-1 immunoreactivity was detected in M. bovis BCG cell lysates or in M. smegmatis-P1 culture filtrates . We next examined whether mycosin-1 is expressed during infection of macrophages, by examining total cell lysates of P388D1 macrophages infected with the M. tuberculosis clinical strain GSH-3052. An immunoreactive band of ~40 kDa was detected by Western blotting in infected but not uninfected cell lysates (Fig. 3, lanes 6 and 7). This band was notably smaller than the ~50 kDa band observed in cell lysates from broth-grown M. tuberculosis and M. smegmatis-P1 (Fig. 3, lanes 3 and 4), but similar in size to the band detected in 6-week M. tuberculosis culture filtrates (Fig. 3, lanes 5 and 7). Mycosin-1 without the propeptide has a putative mass of ~39 kDa and these results therefore suggest that mycosin-1 is expressed and may be processed during intracellular residence. Sequence analyses of mycosin-1 suggested that the protein is secreted and membrane anchored. Furthermore, when expressed heterologously in M. smegmatis, mycosin-1 was located in the membrane / cell wall . Subfractionation of cell lysates into wall, membrane, and intracellular fractions indicated that mycosin-1 was present only in the cell wall and membrane fractions of M. smegmatis-P1, as expected, and was also located in these fractions in M. tuberculosis (Fig. 4). Consistent with this, abundant staining for mycosin-1 was detected in the cell envelope in both M. smegmatis-P1 (Fig. 5B) and in M. tuberculosis (Fig. 5D), by immunoelectronmicroscopy, with minimal staining in the negative controls (Fig. 5A and 5C). 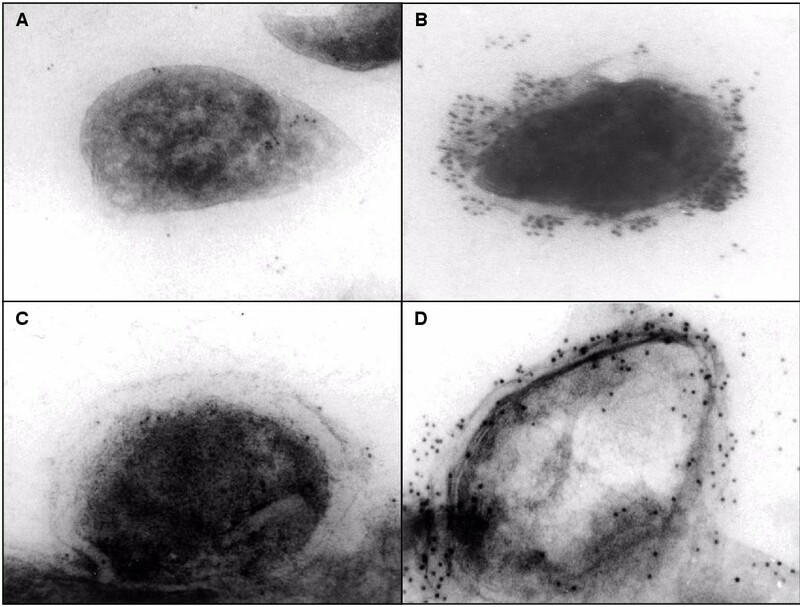 Subcellular localization of mycosin-1 in M. smegmatis -P1 and M. tuberculosis . Bacteria were isolated after three weeks (M. tuberculosis) or two days (M. smegmatis) of growth in culture. Bacterial cell lysates were subfractionated into cell wall (w), cell membrane (m), and intracellular (i) fractions. Fractions were resolved by SDS-PAGE and analyzed by Western blotting using anti-mycosin-1 antiserum. Molecular weights (in kDa) are indicated on the left. Electron micrographs of M. smegmatis -P1 and M. tuberculosis following immunogold labeling with anti-mycosin-1 antiserum. Bacterial pellets were first incubated with anti-mycosin-1 antiserum, fixed, cryosectioned, and labeled with 5-nm gold particles. (A) M. smegmatis transformed with vector only (p19Kpro); (B) M. smegmatis-P1; (C) M. tuberculosis incubated with pre-immune serum as primary antibody; and (D) M. tuberculosis incubated with anti-mycosin-1 antiserum. Using 125I-fibrinogen as a substrate, we next examined whether mycosin-1 possessed proteolytic activity. 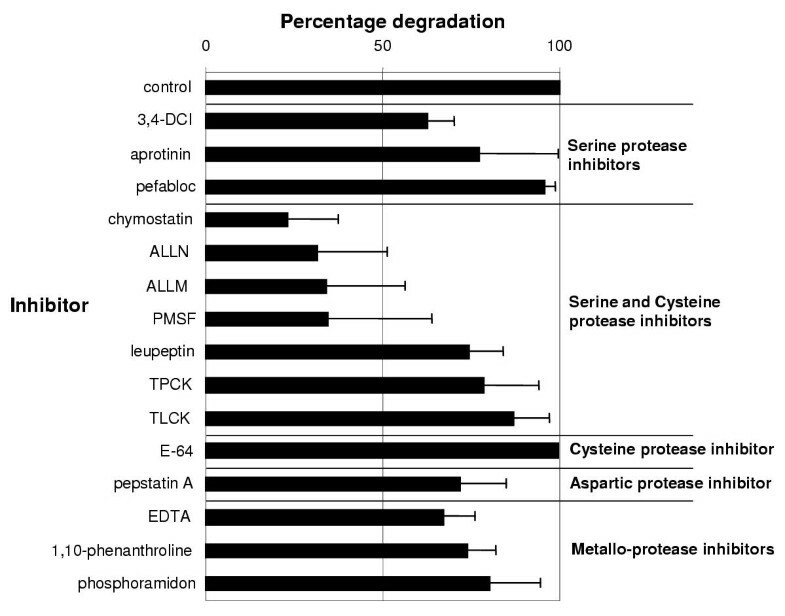 Assays of whole cell lysates of E. coli or M. smegmatis expressing mycosin-1, as well as purified GST-mycosin-1 fusion protein, revealed no protease activity (results not shown). The recombinant GST-mycosin-1 fusion protein may have been inactive because of incorrect folding of the fusion protein or incorrect processing of the prepromycosin. 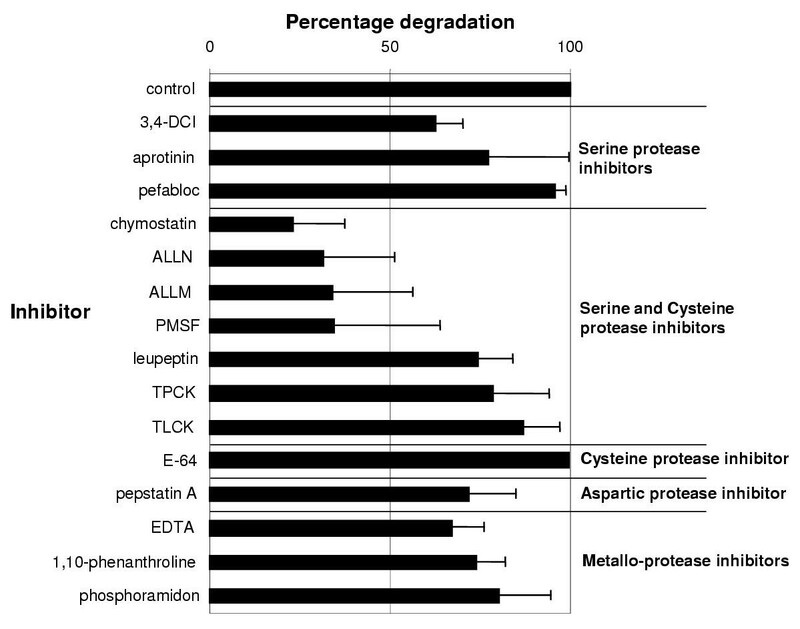 Propeptide removal is usually required for activation of secreted bacterial proteases , but treatments of M. smegmatis-P1 lysates with acidic buffers or limited tryptic digestion were unsuccessful (results not shown). The conditions required for pro-peptide removal and activation of mycosin-1 are unknown and evidently not present in M. smegmatis. Moreover, the substrate specificity, optimal pH and temperature, and requirement for cofactors have not been determined for mycosin-1. M. tuberculosis lysates were also inactive, but these were only tested after heat-killing the pathogen at 80°C for 45 min. As lower molecular weight isoforms of mycosin-1 were identified in culture and during infection of macrophages, we next examined whether protease activity could be detected in culture supernatants of M. tuberculosis. Although variable from experiment to experiment, requiring 20-fold concentration and extended (16–18 h) incubations with substrate, protease activity could be detected in M. tuberculosis culture filtrates after growth in Kirchner's medium for 2 weeks, reaching a maximum after 4 weeks (results not shown). In contrast, M. bovis BCG culture filtrates contained low levels of protease activity that were poorly reproducible. Similarly, M. smegmatis culture filtrates contained low or undetectable levels of protease activity, with no differences between wild-type and transformed strains (not shown). To examine this proteolytic activity further, 125I-fibrinogen was incubated with M. tuberculosis GSH-3052 culture filtrate in the presence of diverse, class-specific protease inhibitors. This analysis revealed that the proteolytic activity was significantly inhibited by serine and cysteine protease inhibitors (Fig. 6), with strongest inhibition obtained with chymostatin (77 ± 14%), ALLN (69 ± 20%), ALLM (66 ± 22%), and PMSF (66 ± 30%). Some subtilisins, including mycosin-1 (Fig. 2A), contain a cysteine residue near the active site histidine, which renders these enzymes susceptible to some cysteine protease inhibitors [5, 6]. Moderate inhibition was also noted with 3,4-dichloroisocoumarin (38 ± 8%) and EDTA (33 ± 9%), whereas inhibition by other inhibitors was variable and generally less than 20%. Proteolytic activity was enhanced 38% by the addition of 2.5 mM Ca2+ but was unaffected by 0.1 mM Zn2+ (results not shown). The results suggest that the predominant protease activity in M. tuberculosis culture filtrates comprise one or more serine and/or cysteine proteases that are partially Ca2+ dependent. Attempts at purifying this activity failed (data not shown). Degradation of 125 I-fibrinogen by M. tuberculosis culture filtrates and inhibition by class-specific protease inhibitors. Culture filtrates were concentrated 20-fold and incubated with 125I-fibrinogen for 16 h. Class specific protease inhibitors (defined in the text) were added to the protease assays, which were performed as described in the Methods. Extent of 125I-fibrinogen degradation was quantified by measurement of TCA-soluble counts. Results are expressed as percent degradation relative to control (no inhibitor) and are the means ± standard deviations of four independent experiments. In conclusion, mycosin-1 is an extracellular protein that is membrane- and cell wall-associated, and is shed into the culture supernatant. The protein is expressed after infection of macrophages and may be subjected to proteolytic processing intracellularly. Although proteolytically active mycosin-1 could not be generated recombinantly, serine protease activity was detected in M. tuberculosis culture filtrates. The function of the mycosins during intracellular growth of M. tuberculosis is still unknown and awaits further investigation. E. coli XL-1 Blue (Stratagene) was used as host strain for transformations of the vectors pGEX-2T (Pharmacia), p19Kpro (a gift from Koen De Smet, Imperial College Medical School at St Mary's, London, UK), and pBluescriptSK (pBS) (Stratagene). pGEX-2T is an E. coli expression vector for the expression of a heterologous protein with an N-terminal GST fusion partner, and p19Kpro is a mycobacterial expression vector derived from p16R1 with a constitutive 19 kDa antigen promoter . M. tuberculosis clinical isolate GSH-3052  and the laboratory strain H37Rv were maintained on Lowenstein-Jensen slopes and grown as liquid cultures in Kirchner's medium, at 37°C with shaking (200 rpm). M. smegmatis (mc2155) was grown as described . All DNA manipulations were carried out using standard techniques . Full-length mycP1 and mycP1 lacking the signal peptide-encoding sequence (mycP1-) were amplified using 5'-ACA GGA TCC GTC AAG TGG CCC AAG GTA GCA-3' (corresponding to nucleotides -71 to -51) and 5'-CGT TCT AGA GGA TCC CCC GCA TCG GCC ATC ACG-3' (corresponding to nucleotides 52–69) as the forward primers, respectively, and 5'-AA AGA ATT CTG CAG TCA TCG GCG GCT CAG CG-3' as the reverse primer. Amplification was performed with the Expand™ High Fidelity PCR System (Roche) using approximately 100 ng of M. tuberculosis cosmid Y15F10 DNA as template (Genbank accession no. Z94121, obtained from the Sanger Centre, UK). The mycP1 (containing ~70 bp upstream of the putative start site to incorporate any putative translation signals) was cloned into p19Kpro (p19K-P1), andmycP1- (lacking the signal peptide sequence) was cloned in-frame with the glutathione S-transferase (GST) gene in pGEX-2T (pGEX-P1). Electroporation of M. smegmatis was performed as described . The GST-mycosin-1 fusion protein was expressed and purified essentially as described . One hundred micrograms of purified GST-mycosin-1 in incomplete Freund's adjuvant was injected subcutaneously into two female New Zealand White rabbits. Three additional booster injections were given at 3-week intervals. Approximately 10 ml of blood was taken from each rabbit at 1 and 2 weeks after the last booster injection and used as anti-mycosin-1 antiserum. To enhance its specificity, the antiserum was depleted of non-specific antibodies by consecutive passage over Sepharose 4B columns containing E. coli and M. smegmatis cellular lysates. To obtain mycobacterial cellular lysates, wild-type and transformed M. smegmatis were grown in liquid broth, cells were harvested by centrifugation, washed twice in PBS, resuspended in 2% SDS, and then sonicated (W-385 sonicator, Heat Systems-Ultrasonics, Inc; output level 3; 80% duty cycle) on ice for 3 periods of 4 min each. After extraction of protein at 60°C for 2 h, the extract was centrifuged at 12 000 × g for 20 min to remove insoluble material. SDS extraction of M. tuberculosis GSH-3052 proteins was performed as above, except that prior to sonication the bacteria were heat-killed at 80°C for 45 min. In addition, culture filtrates from various stages of growth were harvested, dialyzed against sterile water, and then lyophilized. P388D1 macrophages were grown and maintained in RPMI-1640 medium supplemented with 10% heat-inactivated FBS and were infected with the M. tuberculosis clinical strain GSH-3052 at a ratio of 50 bacilli/cell for 5 h at 37°C. After washing in PBS, fresh RPMI-1640 medium was added and the infected cells were incubated at 37° C for 6 days. The cells were then washed with PBS to remove any extracellular bacteria, detached in 5-mM EDTA, sonicated for three periods of 4 min on ice, and centrifuged at 100 000 × g for 3 h. The pellet was resuspended in SDS loading buffer, resolved by SDS-PAGE, and analyzed by Western blotting, using anti-mycosin-1 antiserum (1:1 000) as the primary antibody. To obtain subcellular fractions of M. smegmatis, bacteria were isolated after two days of growth in culture, resuspended in PBS and sonicated, as described above. The lysate was then centrifuged at 1 000 × g for 30 min, to remove debris and intact bacteria. The supernatant was incubated with DNAse I and RNAse at 4°C overnight and then centrifuged at 20 000 × g to collect the cell wall fraction (pellet). The supernatant was then centrifuged at 100 000 × g for 3 h to isolate the cellular membranes (pellet) and cytoplasm (supernatant), which was further concentrated 2–3 fold using 10 kDa Amicon spin columns. The cell membrane and cell wall fractions were resuspended in 2% SDS and heated at 60°C for 2 h, after which insoluble components were again removed by centrifugation. Subcellular fractionation of M. tuberculosis GSH-3052 proteins was performed as above, except that cultures were grown for 3 weeks and prior to sonication the bacteria were heat-killed at 80°C for 45 min. For immunoelectronmicroscopy, whole bacteria were incubated with anti-mycosin-1 or preimmune antiserum, fixed in 2% paraformaldehyde / 0.05% gluteraldehyde in 0.1 M phosphate buffer (pH 7.4), embedded in 2% low-melting-point agarose, sucrose-infiltrated by serial passage through a 50–100% sucrose gradient, and then cryosectioned at -100 to -110°C. Ultrathin sections were placed onto formvar-coated nickel grids. Non-specific antibody binding was blocked with 0.02 M glycine followed by 1% BSA, and the grids were then incubated on goat anti-rabbit IgG conjugated to 5 nm-diameter gold particles. After washing with 1% BSA and PBS, postfixing in 1% gluteraldehyde and staining with uranyl acetate/methylcellulose, the sections were viewed by transmission electron microscopy (Zeiss EM 109, 80 kV). Mycobacterial culture supernatants were harvested by centrifugation, filtered (0.22-μm filter), adjusted to 0.02% Na azide, and concentrated 20-fold (Amicon, 10 kDa cut-off). Mycobacterial culture filtrates, bacterial whole cell lysates containing recombinant mycosin-1, and purified GST-mycosin-1 fusion protein were assayed for proteolytic activity by incubation with 125I-labeled fibrinogen, prepared as described . Assays consisted of 200 μl of concentrated filtrate made up to a final volume of 500 μl in 75 mM Hepes, pH 7.3, containing 1.5–2.0 × 106 c.p.m. 125I-fibrinogen, and were incubated at 37°C with rotation for 16–18 h. Fibrinogen degradation was determined quantitatively by trichloroacetic acid (TCA) precipitation as described . The inhibition of proteolytic activity of M. tuberculosis culture filtrates by class-specific protease inhibitors was investigated by addition of each of the following inhibitors to the reaction: (A) Serine protease specific inhibitors: 3, 4-DCI (3, 4-dichloroisocoumarin) (1 mM), aprotinin (2 μg/ml) and pefabloc (1 mM). (B) Mixed serine and cysteine protease inhibitors: chymostatin (0.2 mM), ALLN (N-acetyl-Leu-Leu-norleucinal or Calpain Inhibitor I) (200 μg/ml), ALLM (N-acetyl-Leu-Leu-methional or Calpain Inhibitor II) (100 μg/ml), PMSF (phenylmethanesulfonyl fluoride) (1 mM), leupeptin (0.4 mM), TPCK (L-1-chloro-3-[4-tosylamido]-4-phenyl-2-butanone) (100 μg/ml) and TLCK (L-1-chloro-3-[4-tosylamido]-7-amino-2-heptanone HCl) (100 μg/ml). (C) Cysteine protease specific inhibitor: E-64 (L-trans-epoxysuccinyl-leucylamido-[4-guanidino]-butane) (0.05 mM). (D) Aspartic protease specific inhibitor: pepstatin A (50 μg/ml). (E) Metallo-protease inhibitors: EDTA (ethylenediaminotetraacetic acid) (10 mM), 1, 10-phenanthroline (2 mg/ml) and phosphoramidon (0.09 mM). This work was supported by awards under the Glaxo Wellcome Action TB initiative and by funds from the University of Cape Town. We are indebted to Colette Cywes and Tommy Haylett for assistance with mycobacterial and cell cultures, and Mohammed Jaffer and Richard Kirsch for help with the electron microscopy. This work is dedicated to the memory of Albert Beyers. J.A.D. helped conceive of the study, participated in its design, carried out the experimental part of the study and drafted the initial manuscript. N.C.G.v.P. participated in M. tuberculosis subfractionation and protease activity assays and edited the manuscript to its final form. A.D.B., M.R.W.E. and G.D.B. conceived of the study, participated in its design, and supervised and coordinated the work.